Joy is the all-purpose cookbook. There are other basic cookbooks on the market, and there are fine specialty cookbooks, but no other cookbook includes such a complete range of recipes in every category: everyday, classic, foreign and de luxe. 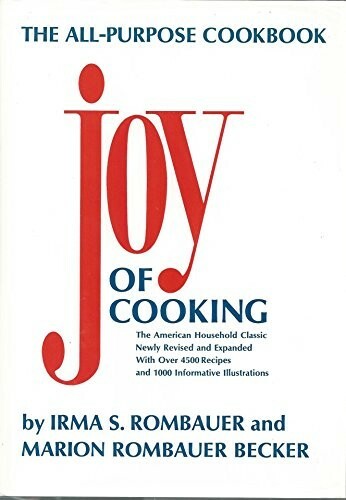 Joy is the one indispensable cookbook, a boon to the beginner, treasure for the experienced cook, the foundation of many a happy kitchen and many a happy home. Privately printed in 1931, Joy has always been family affair, and like a family it has grown. Written by Irma Starkloff Rombauer, a St. Louisan, it was first tested and illustrated by her daughter, Marion Rombauer Becker, and subsequently it was revised and enlarged through Marion's efforts and those of her architect husband, John W. Becker. Their sons -- Ethan, with his Cordon Bleu and camping experiences, and Mark, with his interest in natural foods-have reinforced Joy in many ways. Now over forty, Joy continues to be a family affair, demonstrating more than ever the awareness we all share in the growing preciousness of food. Special features in this edition are the chapter on Heat, which gives you many hints on maintaining the nutrients in the food you are cooking, and Know Your Ingredients, which reveals vital characteristics of the materials you commonly combine, telling how and why they react as they do; how to measure them; when feasible, how to substitute one for another; as well as amounts to buy. Wherever possible, information also appears at the point of use. Divided into three parts, Foods We Eat, Foods We Heat and Foods We Keep, Joy now contains more than 4500 recipes, many hundreds of them new to this edition -- the first full revision in twelve years. All the enduring favorites will still be found. In the chapter on Brunch, Lunch and Supper Dishes there are also interesting suggestions for using convenience and leftover foods. Through its more than 1000 practical, delightful drawings by Ginnie Hofmann and Ikki Matsumoto, Joy shows how to present food correctly and charmingly, from the simplest to the most formal service; how to prepare ingredients with classic tools and techniques; and how to preserve safely the results of your canning and freezing. Joy grows with the times; it has a full roster of American and foreign dishes: Strudel, Zabaglione, Rijsttafel, Couscous, among many others. All the classic terms you find on menus, such as Provencale, bonne femme, meunière and Florentine, are not merely defined but fully explained so you yourself can confect the dish they characterize. Throughout the book the whys and wherefores of the directions are given, with special emphasis on that vital cooking factor -- heat. Did you know that even the temperature of an ingredient can make or mar your best-laid plans? Learn exactly what the results of simmering, blanching, roasting and braising have on your efforts. Read the enlarged discussion on herbs, spices and seasonings, and note that their use is included in suitable amounts in the recipes. No detail necessary to your success in cooking has been omitted. Joy, we hope, will always remain essentially a family affair, as well as an enterprise in which its authors owe no obligation to anyone but to themselves and to you. Choose from our offerings what suits your person, your way of life, your pleasure -- and join us in the Joy of cooking. Because of the infinite patience that has gone into the preparation of Joy of Cooking, the publishers offer it on a money-back guarantee. Without question there is no finer all-purpose cookbook.